A ca.1934 Westbrook Junior College student portrait has written in pencil on the back N. Morse. Miss Morse's dark hair is pulled back behind her ears with a centered parting. 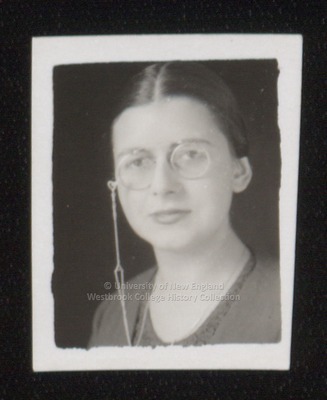 She wears pince-nez eyeglasses with an eye glass chain going around her neck.